21 Uses for Epsom Salt: From:http://wellnessmama.com/8509/21-uses-for-epsom-salt/ | mizzeliz – working for you.. 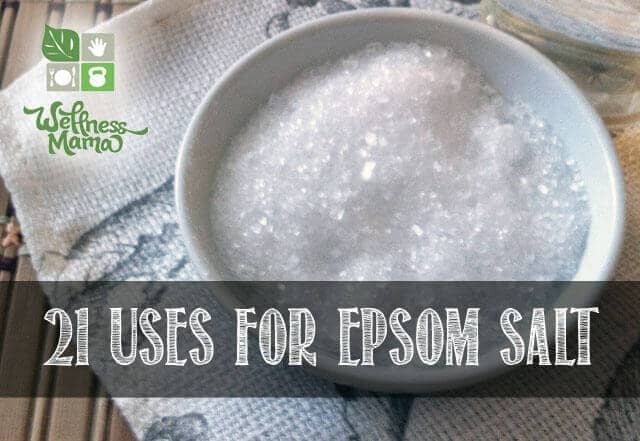 I am re-posting this because I knew only a few of these uses so I need to have them here to remind us..
As a relaxing Magnesium Bath Soak – Add at least 1 cup of epsom salt to a warm bath and soak for 20 minutes. Splinter Removal- Soak in concentrated epsom salt water to pull out a splinter. Magnesium Foot Scrub- Make a homemade magnesium scrub (recipe here) for a boost of magnesium and super soft skin. Better Vegetables- Add a tablespoon of epsom salt to the soil below a tomato plant to boost growth. Facial Wash- Add a pinch of epsom salt to your usual face cleaner (or to your oil cleansing routine) for a skin exfoliating magnesium boost. Tile/Grout Cleaner- Mix equal parts of liquid dish soap and epsom salts and use to scrub tile and grout. Rinse well for a streak free shine. Body Aches- Add 2 cups of epsom salt to a warm bath and soak for at least 20 minutes to help relieve muscle sprains and for a transdermal magnesium boost. Homemade Sea Salt Spray- Make your own sea salt spray to add texture and volume to hair- recipe here. Water House Plants- Help house plants grow by adding a couple tablespoons of epsom salt to the water when you water them. Volumizing Hair Mask- Combine equal parts of conditioner and epsom salt and leave on hair for 20 minutes. Rinse well and let air dry for thicker hair. Foot Soak- For a concentrated magnesium boost, add 1 cup of epsom salt to a hot foot soak and soak for 20 minutes. Get rid of slugs- Have slugs in your garden or on your patio? Sprinkle epsom salt to deter them. Making Magnesium Lotion- Using magnesium flakes is a better option, but in a pinch, you can use epsom salt to make homemade magnesium oil (recipe here). Laxative- For occasional constipation, a teaspoon of epsom salt dissolved in water can help. Check with a doctor first. Beautiful Roses- Add a tablespoon a week to the soil around rose bushes before watering for faster growth. Soil Prep- Before planting, we add a few bags of epsom salt to the soil in the garden and water in to help replenish soil magnesium levels. Headache relief- There is evidence that soaking in a soothing epsom salt bath may help relieve headache. Smooth skin- Mix 1/2 cup epsom salt with 1/4 cup olive oil and scrub skin in the shower for healthy and smooth skin. Itchy Skin or Bug Bites- Dissolve a tablespoon of epsom salt in to 1/2 cup of water and cool. Spritz on itchy skin or apply a wet compress to help relieve itching. Minor Sunburn Relief- Use the same ratio in the itchy skin relief above and spritz on to minor sunburns to help soothe them. Help Kids Sleep Better- Add a cup to kids’ bath water before bed to help them sleep peacefully..
How do you use epsom salt? Share your tips below! Posted in: Better Hair and Skin, Better Health, New uses for every day things..